is a Scottish comedy-drama film directed by Ken Loach, starring Paul Brannigan, John Henshaw, William Ruane, Gary Maitland, Jasmin Riggins, and Siobhan Reilly. It tells the story of a young Glaswegian father who narrowly avoids a prison sentence. He is determined to turn over a new leaf and when he and his friends from the same community payback group visit a whisky distillery, a route to a new life becomes apparent. The title is from "the angels' share", a term for the portion (share) of a whisky's volume that is lost to evaporation during aging in oak barrels. Nice ! I want one ! You wouldn't want this one, it's full of tea! So 40% tea - but what is the rest ? The colour alone gives it away. For a Brit that's an awful weak brew. Bells is horrendous stuff, I don't even take that to my boys drinking weekend for 2am in a field. My go to cheap slugging whisky is Famous Grouse. I saw this and really enjoyed it, especially after being in Scotland. We definitely got a whiff of the Angel's Share when we visited the cask vault. The minute they opened the door it was overpowering, and really nice! My go to cheap slugging whisky is Famous Grouse. Same here. When the missus and I were touring Scotland, we noticed that all the bars kept Famous Grouse as their bar/blended scotch. So I bought a bottle when we got home and have kept one on hand for Rusty Nails and her family. ...or around here that you like rap but not Prog. To my tongue Bourbon and Irish whiskey has a sweetness that I could do whithout. Its good in a drink, coffee, but pure or on the rocks it taste 'cheap' somehow. I find there are some excellent bourbons out there, like Knob Creek for example. Knob Creek is my go-to for bourbon. I like the caramel notes--they really come through in this, without being cloying. But Bourbon is not Scotch.....and bourbons, in general, I find to have far less variety than Malts. I hate to admit it, but when it comes to whiskey, it's Wild Turkey 100 proof. I want to try a high end single malt Scotch. So far the worst alcoholic beverages I've had, contained Scotch. Ian will back me up on this: nothing stronger than Babycham for the ladies! I'll have to try The Famous Grouse. My wife started a teetotaler when we first met but she was on vodka and orange within a few weeks, not sure what that says about me. I've known a few whisky drinking cigar smoking women with potty mouths, all of them lovely ladies. I like the Knob. 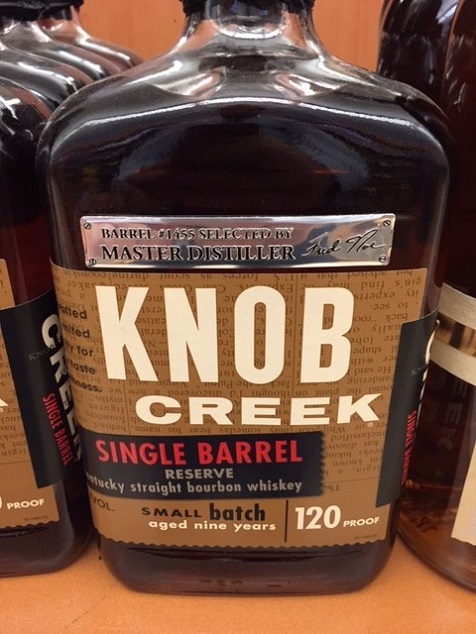 Many don't know that Knob is produced by the makers of Jim Beam, which also produces a few other popularized small batch bourbons: Booker's, Baker's, and Basil Hayden's. I like Knob from that group, however everyone should try Booker's at least once as it's a cask strength monster!